A Tibetan<->English dictionary application that contains various dictionaries and that can be used either online or as Android app. If you want to install an older version of the app, you can download older versions from github. Older versions of the app up to version 0.0.10 also support Android 4.0 and higher. Dr. Alexander Berzin’s English-Tibetan-Sanskrit Glossary. Richard Barron’s glossary. © Copyright 2002 by Turquoise Dragon Media Services. “Verbinator” Tibetan Verb Dictionary (Verbinator 2000). Taken from: Hill, Nathan (2010) “A Lexicon of Tibetan Verb Stems as Reported by the Grammatical Tradition” (Munich: Bayerische Akademie der Wissenschaften, ISBN 978-3-7696-1004-8. If you want to support the author and the publisher please consider buying this book (regular price: 58 EUR plus shipping). The Uma Institute for Tibetan Studies Tibetan-Sanskrit-English Dictionary (Version: June 2015) by Jeffrey Hopkins and others. Dan Martin: “Tibetan Vocabulary.”, April 2003. James Valby’s Tibetan-English Dictionary. © James Valby. Ives Waldo’s glossary compilation. © Ives Waldo. Input occurs in Wylie or with a Tibetan keyboard layout (you can for example use the Tibetan keyboard from Irom Rabbit which is available in the Google Play Store if you don’t want to type in Wylie transliteration). 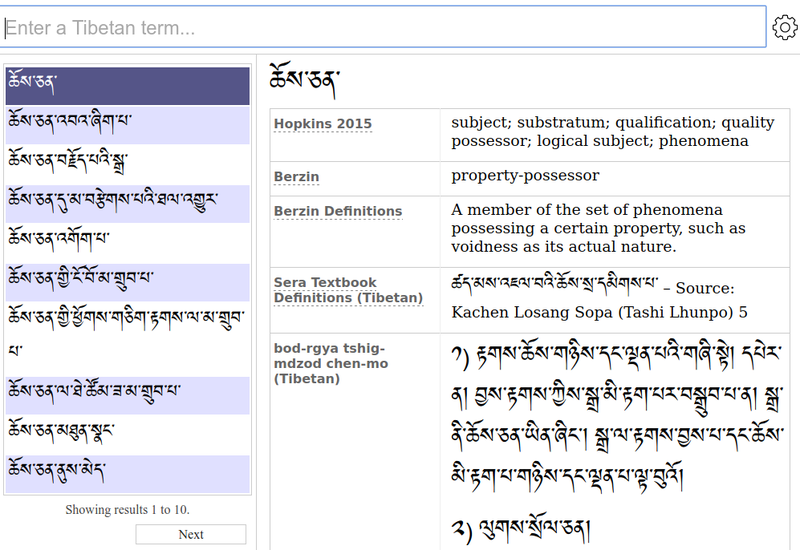 See also www.christian-steinert.de for further resources and pointers to other Tibetan dictionary programs. See also this overview of other dictionary programs by other developers.